As we have stated before, Mouery's Flooring offers a variety of flooring products that can fit almost any need. Our favorite product to sell is hardwood flooring both solid and engineered. Each of the hardwood flooring types comes with different advantages and disadvantages. However, we are going to talk about a company that sells engineered hardwood: Regal Hardwoods. Machine-scraped hardwood floors have a repetitive pattern that can make some woods look unauthentic. Authentic hand-scraped wood flooring bypasses that problem because each board is uniquely hand crafted so that no two boards are the same. Regal Floors have exceptional craftsmanship. From the deeper grooved, distressed Old Time Luxe to more of a traditional, scraped floor in their Havana, Final Touch, and Element collections. They also have wire brushed floors like their On the 9 or Final Touch, New England collections. These offer a weather and lighter textured look. Regal Hardwoods is dedicated in preserving the environment for future generations. They are FSC certified and comply with California Air Resources Board’s (CARB) stringent requirements for formaldehyde emissions. Regal Hardwoods finishes have low volatile organic compounds (VOCs) to conserve the environment. There are two types of hardwood flooring offered by Regal Hardwoods: Titanium ScuffGARD and Hard Wax Oil. These flooring types will be discussed in the following videos. Most engineered hardwoods have either a rotary, sawn, or sliced hardwood veneer. Regal Flooring takes their looks one step further and produce their veneers on an offset rotary peel. The offset rotary peel gives the floors a tighter grain and the capability of deeper, richer, and more unique coloring. This unique look is produced by staining or chemically etching their colors on the open cross grains cut by their rotary peel. Regal's Titanium ScuffGARD finish utilizes the latest in nano-technology to provide a rugged and durable yet transparent wear protection that resists scuffing and allows your hardwood flooring to stand up to years of use. This particular product has hand-finished visuals. Regal's protective hard wax oil finish enhances the natural highlights of the wood's colors, and the oil brings out the inherent beauty of the wood grain. The oil is a based from coconut oil which is sprayed on and then hand buffed out. The tough protective wax coating creates a solid barrier that helps keep your floors beautiful through the years. They color their oil finish floors through a chemical reaction. They apply a chemical to the floors, and then they react to the chemical to give it the color variation. Afterwards, they hand wipe the chemicals off. American Backroads offers a worn, distressed, matte finish, barnwood, reclaimed look that is sure to be a design masterpiece. On the 9 offer a high color variance, with deep grooves that will make any home look rustic. Caring for your hardwood flooring is important for every homeowner to know. However, both the titanium finish and the wax oil require different care and cleaning. 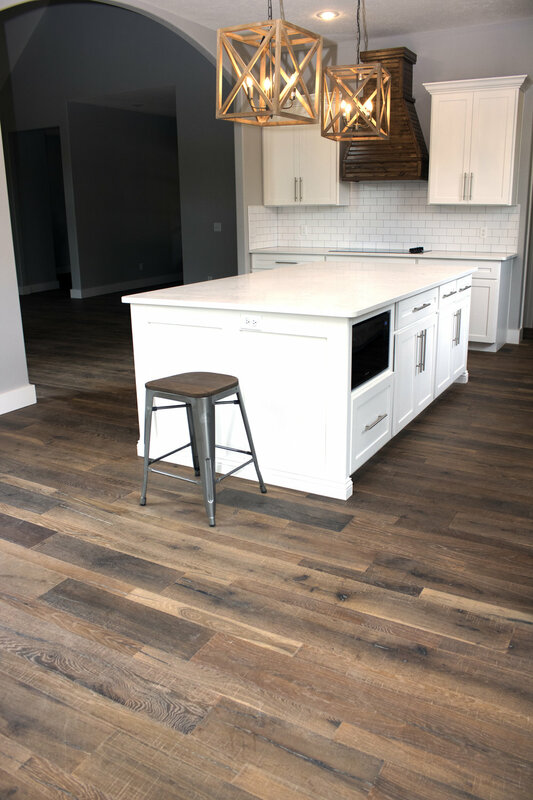 If you have any further questions, feel free to give us a call at 417-883-4720, email us at flooring417@gmail.com, or even stop by the showroom to see these products for yourself. You will find us located at 2516 W. Battlefield Road, Springfield, MO 65807. We love to keep you informed of the latest trends in the flooring industry and with companies that provide great products.